Japan’s Hitachi and the U.S. construction giant Bechtel, will build 5,400 MW of new nuclear power generating capacity at two sites. The first unit at Wylfa is expected to be in revenue service by the mid-2020s. 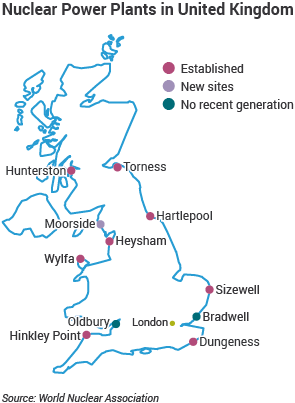 In a burst of optimism surpassing the current troubles afflicting the UK’s Hinkley Point nuclear project, the UK’s Horizon Nuclear Power has announced its team that will build 1350 MW ABWRs at Wylfa Newydd, on the Isle of Anglesey and at Oldbury-on-Severn in South Gloucestershire. The agreement brings together the capabilities of three industry leaders. Bechtel has delivered megaprojects in the UK including the Channel Tunnel, High Speed 1, and Crossrail and has performed services on more than 150 nuclear power plants worldwide. Hitachi-GE will provide the Generation III+ Advanced Boiling Water Reactors to be used at the plant. Japan Gas Corp., the third partner, has engineered and built refineries and power plants since 1928. Bechtel added in its press statement that it took TVA’s Watts Bar II to completion. That reactor achieved its first criticality this week. Horizon Nuclear Power’s Wylfa Newydd plant will provide low-carbon nuclear energy to up to 5 million homes. Construction will create 8,000 to 10,000 jobs at peak periods and the plant will support 850 permanent jobs on the Isle of Anglesey, adjacent to the site of two older UK reactors scheduled for decommissioning. Duncan Hawthorne, Horizon CEO, said that the UK ABWR is on schedule to complete the Generic Design Assessment by the end of 2017. The joint venture will be called Menter Newydd, which means “new venture” in Welsh. It will initially provide front-end engineering and construction planning prior to full construction, expected to begin by 2020. The UK nuclear consortium NuGen, said last week that it may be generating power with three Westinghouse 1150 MW AP1000 nuclear reactors by 2025. Robert Armour, Deputy Chairman of NuGen, made the statement at a Platts nuclear energy conference in London last week. He said that it is entirely possible the Moorside plant will come on to the grid before the twin Areva EPRs at Hinkley Point. NuGen plans to build the reactors at the Cumbria site at what has come to be called the Moorside project. When fully operational it is expected to supply 7% of electricity for the UK. Armour also expressed confidence that Westinghouse will complete the Generic Design Assessment for its reactor in 2017. Earlier this year the UK nuclear safety agency conducting the assessment said that Westinghouse needed to step up its game to be fully compliant with the detailed requirements of the process. Wire services in the UK reported May 24 that Vincent de Rivaz, CEO of French energy giant EDF, expressed confidence that the Hinkley Point nuclear power station will go ahead despite a new delay in making a final investment decision. He made his statement in testimony to the Energy and Climate Change Committee of the UK parliament. Top government officials in France and the UK have nevertheless expressed confidence in the eventual completion of the project. In the UK, PM David Cameron echoed Hollande’s support for the project. More recently, the UK Department of Energy & Climate Change, said through its head of investor relations Jeremy Allen, that his government is confident the equity elements of the project will be resolved in a satisfactory manner. However, recent developments indicate EDF is facing significant challenges in that area. Rating agencies Standard & Poors and Moody’s lowered their forecasts for EDF saying efforts to make the company more efficient were not good enough. Also, they said the addition of $4 billion in new capital was not sufficient to support the firm’s plan to sustain a 66% equity stake in the Hinkley Point project. In response French President Hollande vowed to double down on restructuring EDF and increase its financing, and for Areva, because the country’s national security interests depend on both firms being vital contributors to the nation’s nuclear fleet. The industry employs nearly 200,000 workers and its reactors supply most of the nation’s electricity. While Hollande was making these promises, a spokesman for China General Nuclear (CGN) said that it would not go it alone with Hinkley Point if EDF was unable to hold up its end of the financing of the $18 billion project. CGN and China National Nuclear Corp. (CNNC) have agreed in principle to take a 33% equity stake in the project. In return for investment in Hinkley, the UK will support their joint effort to build a Chinese reactor, the Hualong One, a 1000 MW PWR, at the Bradwell site in the UK. The government also said it would facilitate the Generic Design Review process for the reactor. The first two Hualong One reactors began construction in Fujian province, China in September 2015. Hollande also faced questions about the project much closer to home. Segolene Royal, who is the French Energy Minister, and also the mother of Hollande’s four children, expressed concern about the “colossal sums” involved in the project and raised expectations that she might try to block a commitment to move ahead with the twin 1600 MW Areva EPRs. Areva has so far been building two EPRs in the West. One in Finland and the other in France. Both projects are behind schedule and over budget. In Finland there are multiple legal dispute between the firm, its partner Siemens, and the Finish nuclear utility TVO, and the Finnish nuclear safety agency. Efforts to mediate these disputes collapsed this week as Areva’s proposals to resolved them were left on the negotiating table. Areva’s construction of two EPRs in China have fared much better and both reactors are headed towards completion without the kinds of troubles that have afflicted its two projects in Europe.